I have paintings in progress to finish up and post about this week but didn't feel that they were at a good point to share so I thought I would give a very brief description of my current art study fascination, Luminism. First, I want to share how I got onto that particular topic. I had neglected to mention a month or two ago the end of what would have been my third year of art school and the beginning of my fourth and final year. I guess I have moved from the art student mindset to the artist-scholar mindset. A subtle shift but an important one. I am sure my technical skills would be a bit more refined had things worked out differently but I don't think I would be where I am now in terms of direction and voice. I have the many professional artists I connect to and follow through blogs and social media to thank for that. I found a way to continue my education through their expertise, tips, and fine examples. I am very grateful for that! I have been following in their footsteps of hard work and many failures and am starting to find my direction and voice. I still have so far to go as I am only just beginning. Never fear, I will be sharing more of that here over the next several weeks! With all that in mind, my studies have taken on a greater focus which brings me back to Luminism. I have been studying both Luminism and Tonalism (mentioned in a previous post). Thankfully the local library has a couple of decent books on the subjects and I have been pouring over them. I can see that I am going to have to hunt some of these paintings down and visit the museums where they hang so I can see them in person. The reading is a bit dry but I have picked up a couple of tips or two. Here are pictures of paintings from two of my favorite Luminist artists. The painting above is by Fitz Hugh Lane. You can see even in this little picture the quality of light, smoothness of the brush strokes, and over all serene feeling of the painting. I have a feeling that I will need a lot of time to take in all the exquisite detail when I go to see them in person. It will be a while before that happens though as I don't wander far from the west coast of the U.S. much these days and most of the paintings seem to be located on the other side of the country. 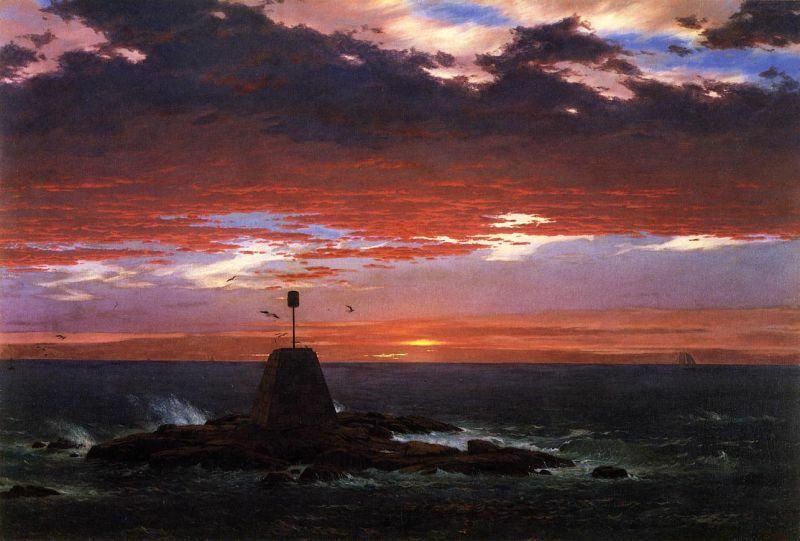 The second painting is by Frederic Edwin Church. 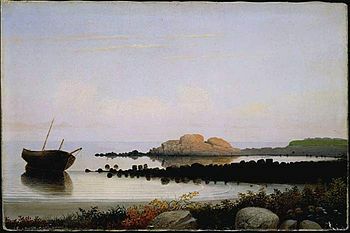 I am studying these artists and more not to copy their techniques but because I would like to achieve some of the qualities of light, color, and atmosphere that they accomplished in their paintings. We shall see what happens with my work over the next few months. I have so much to learn! If these paintings have stirred your curiosity, the internet is a good place to start. I find that some of the more recent books have the best quality reproductions over all. All of the links above are from Wikipedia. There are inconsistencies in the information but you can get the overall feel. That is all for this post. Somewhat of a teaser perhaps but the purpose of my blog is to share my journey. There are a lot of wonderful blogs out there that have information galore on art and the process of making art. Some of them are on the links bar at the right side of my blog. Looking forward to a new week. I have been so excited I haven't been getting much sleep! It is stimulating to see someone like yourself engaging in the wonderful journey of art and aesthetics. I have been drawing, painting, designing, etc. for all of my life and always feel I am still a student with so much to learn, and that process is where the joy is. I sometimes forget, become dull and even a bit depressed, and then I read about someone like yourself and realize I have had, and continue to have, an amazing adventure in my life. PS I also love luminism! Thanks for the comment Karen! Yes, I am a fellow lifelong student. I too have been drawing all my life but didn't get started in art seriously until later in life. Your posts are among those I follow and are listed in my links. I cannot tell you how much I appreciate artists like you who post not only the good but the challenges too. It helps to know that all of it is part of the "normal" process of being an artist. Thanks for stopping by!